Rumors are everywhere that Eliot Spitzer is about to become a cable-news talking head, perhaps at CNN, which needs a new show for its 8 p.m. hour now that Campbell Brown is leaving. Obviously, Spitzer brings with him a certain amount of ... baggage. Although he's been doing a lot of TV, and has repeatedly served as a guest host for MSNBC, it's still only two years ago that he was forced to resign after his taste for high-end prostitutes came to light. No matter what happens from this point on, it will, as they say, be the first line in his obituary. CNN could try to tiptoe around this elephant-sized piece of awkwardness -- or it could use it to give the show a frisson no mere cable news opinion-fest could match on its own. Pairing Spitzer with a female co-host would accomplish that. Not just any co-host, mind you. 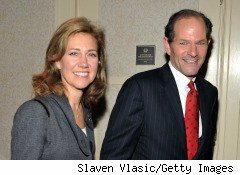 The ideal one would have to be Spitzer's equal in smarts and toughness -- part sparring partner, part work wife, part chaperone. You can see some of this dynamic at play on MSNBC's Morning Joe, where Mika Brzezinski's eye-rolling keeps Joe Scarborough's ego in check. But where Brzezinski is content to let Scarborough do most of the talking, Spitzer requires a more assertive antagonist -- someone who, by verbally flogging Spitzer on camera, would symbolically punish him for his sins toward women and thereby cleanse him of any residual skeeviness viewers might feel toward him. If you have any thoughts on a conservative woman who would fit the bill, drop them in the comments or email me.